Papilio Kids designers take girl’s fashion to the next level. They constantly research the latest fashion trends in order to make every collection stylish and truly unique. 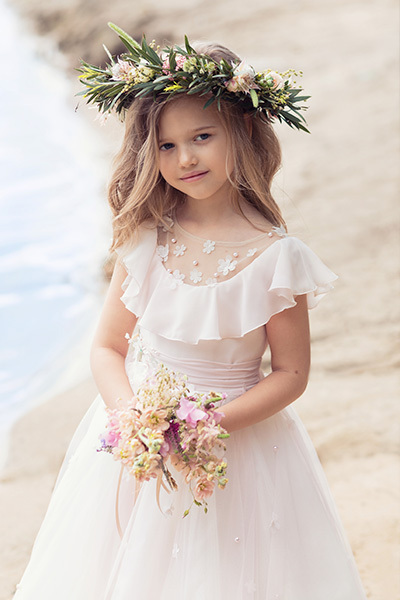 Papilio Kids flower girls dresses are not just the typical pretty and puffy gowns, but a line of exquisitely fashionable pieces for little girls. Below, we have compiled a list of the most popular flower girl dress trends for this wedding season. The favourite accessory for the dresses for the littlest member of your bridal party is always going to be a sash. Match the sash to the colour of your bridesmaid dresses or pick an accent colour. This way, your flower girl is coordinated with the rest of the bridal party. Choose a ball gown style accented with a coloured sash to ensure your little fashionistas feel like little princesses. Update the flower girl dress trend of floral dresses by making them 3D! The appliqués of flowers add depth and extra detail to mesmerize all of your girls. Be aware that all flowers on Papilio dresses are handmade to make them look more real. Every single petal is cut by hand with love and care by one of our skilled seamstresses. Tiered skirts have been one of the most popular flower girl dress trends for the longest time. Try a non-traditional take on this trend by having the tiers end with mismatched lace trims. The uniqueness of each design in Papilio flower girl line speaks to a girl’s personality. Boho-inspired styles are perfect for brides that want their flower girls to wear non-traditional dresses. Boho style flower girls dresses tend to include very natural shapes and details. Flowy silhouettes, tulle and chiffon skirts, and, of course, floral details create truly exclusive bohemian feeling. Lace is one of the most beautiful fabrics in the world. It is sweet, romantic, and lovely for little fashionistas. This season Papilio updated lace flower girls dresses by creating sweet new silhouettes and offering them in vibrant colours like cornflower blue and candy apple red. Mix lace with another fabric, like tulle or organza for a super sweet and sassy look. Papilio Kids collection of flower girls dresses is truly unique and exciting. Papilio designers project women’s fashion trends into girl’s fashion to create a stunning line of non-traditional dresses that all little fashionistas will adore.